It's a bird, it's a plane, no, it's a... dragon? When scientists brought everyone's favorite fairytale creature to life, people flocked to see them, including Zelda Rissland and her little brother Amory. Little did they know, the scientists had created more than just dragons--they created a deadly parasite. 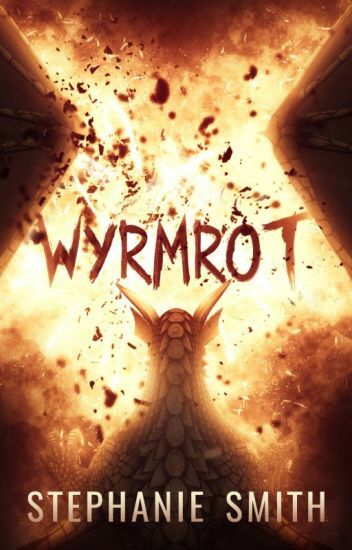 Wyrmrot is what they later called it. First, it ate your brain, and then it made you eat other people's brains. Zelda's brother is now one of the Rotters, and the only person from her former life she has left is Cooper Marotta, her childhood friend turned boyfriend. Together they have managed to carve out a safe place for themselves in a world turned upside down, but their little survivor group is rapidly running out of food. It is only a matter of time before they start turning on each other. When mysterious coordinates appear on a construction sign, Zelda knows there is only one thing to do. Described as Jurassic Park meets Resident Evil,  this is an upper Young Adult Science Fiction novel told in dual timelines. There will be plenty of action and adventure with a dash of romance. Warnings for occasional strong language and some mild gore. Rated PG-13. Updates every Wednesday morning (mountain standard time). ***Wattpad Editor's Choice***Rachel lives in constant fear that she will burst into flames. She can feel the heat building in her gut. She keeps buckets of water under the bed. She keeps them to fend off the flames that her body may create. Autocombustophobia. That's what they say she has. No one will believe Rachel when she explains that she spontaneously combusted once before. That's why her face is covered in burns. Rachel's mother is the only one who knows what really happened to her. All she said was that it was an accident, before she disappeared leaving Rachel to live with her grandparents. When Rachel becomes reunited with her estranged mother,  she struggles to uncover the truth behind her injuries. As Rachel spends time with the mother she has never known, she is thrown into a strange world of paranormal obsession , spells, and sage burning. As long buried family secrets are revealed, Rachel's fear of Spontaneous Human Combustion becomes unmanageable. There are some terrifying truths to uncover, and a man on fire. He stands burning at the foot of her bed. The entity living inside Callan's soul orphaned her at age eleven. By the time she's sixteen, it's ensured her being shunted from one foster family to another. Both actually came from this magical world, but left before Callan was born. To cover their tracks, they'd lied about everything. Even who they really were. Driven to find out where she comes from, Callan's trapped in a race for life and death. Walking away isn't an option, but if she stays too long, the entity will find its next victim. A secret with a taste for destroying her life. Skye's ancestors were brought to life by an ancient spirit under the light of a blood moon. Her father commands a legion of vengeful shapeshifters, the Lìog Airgid, in their fight against an entity that seeks to eliminate them from the face of the earth. As time grows short and hope becomes sparse, Skye must learn the truth. For only the Spiritborne have the means to end the centuries-old war and bring balance between shapeshifters and humankind. Cover design © 2016 by K.V. Wilson; images used from Pexels and Pixabay under creative commons. The Hollow Ball was just the beginning. The sequel to The Hollow Ball. Major Aula Reed is a Canadian fighter pilot, veteran astronaut, closeted bisexual, and survivor of the worst accident in space exploration since Space Shuttle Columbia. The first permanent outpost on the Moon should've been cause for celebration, but its destruction gutted a generation of moonwalkers. By the spring of 2046, the accident approaches its tenth anniversary. Aula is stationed on a new lunar base where her second mission is constantly overshadowed by her first. To live separate from Earth means facing radiation, meteorites, and equipment failure while under constant public scrutiny. Despite the demands of her job, Aula struggles to find meaning in what happened. Even if it challenges the lies she told herself, the people she loves, and the rest of the world. This is a story of the near future informed by the lives of today's astronauts, whose triumphs and tragedies are immortalized in the public eye. Fourteen-year-old Myles is having a rough time. Not only has his mother run off with her female yoga instructor, but his dad has moved the two of them to a remote island to live in a log cabin! He thinks he's going to reinvent himself as some kind of mountain man, but Myles is skeptical. So, what else is there to do here, but keep a journal? Because, as Myles is quickly learning,  truth is definitely stranger than fiction. And sometimes you just have to write this stuff down! "They took my sister. Now I'm taking her back." Seventeen years ago, humans started developing supernatural abilities. Comic books came true as the first person flew, created fire, mind-read. The world entered a new age where people who could do special things were revered and admired. That all changed when one man lost control of his power and unleashed a huge explosion in a crowded shopping centre, killing over a thousand others. A series of fights involving superhumans broke out, resulting in the destruction of multiple cities and hundreds upon hundreds of further lives lost. The government began hunting down those extraordinary people with the assistance of a specialised unit: trained in recognising different abilities. Suddenly powers became something scary, uncontrollable and dangerous, that nobody wanted to own up to having. Seventeen years after the Explosion, Amelie Rose Carmichael is the daughter of the man who is in charge of hunting down and imprisoning these people. She enjoys a comfortable life, protected from any threats against her. But when Amelie develops an ability without warning, she must try to keep it hidden from her family, her friends, and above all her father. Can she keep a secret? Will she use her powers to help the rebel organisation that has approached her? And what secrets are the people around her hiding? Part Two: Sneak Peak up Now! Madeline had always valued the normalcy of her life, but, in retrospect, Madeline's life had been too normal. It'd been too structured, and idealistic. Change shapes all things, and Madeline Alvarez was no exception to this rule. After an 18th birthday she'd never forget, Madeline was set on a path towards - what some would call - her destiny. Madeline would argue with you, to the ends of the earth, about the conceptualised nature of destiny, but self-denial, can only stem so far. Given the thing she'd worked her way towards her entire life, Madeline jumps at the opportunity, throwing herself into a world of danger, and chaos, destruction and death. Subject to a prophecy uttered years before her birth, Madeline must use every shred of power, and knowledge, to survive in this new-world. "You may live as a soldier or face death. Choose wisely." After raiding a rebel camp, sixteen-year-old Ember doesn't understand why killing some boy bothers her. She's a soldier-she has killed hundreds of people without remorse. But after she fails a mission, the rebels hold her hostage and restore her memories. Ember recognizes her sister among the rebels and realizes the boy she killed was Solanine's fiancé. Ember knows she can't hide the truth forever, but Solanine has secrets too. As their worlds clash, the two sisters must decide if their relationship is worth fighting for. And one wrong move could destroy everything-and everyone-in their path.